For starters, I need to tell you that I don’t really love corn. It’s OKAY, but even when the summer’s most amazing, sweetest corn has been picked and sits on the farmers market stands, I just feel kind of MEH about it. Sure, if you slather it up with some butter and salt, it’s pretty delicious – but apparently not delicious enough for me to bother with the hassle of peeling and de-silking it more than once a year. THAT SAID. 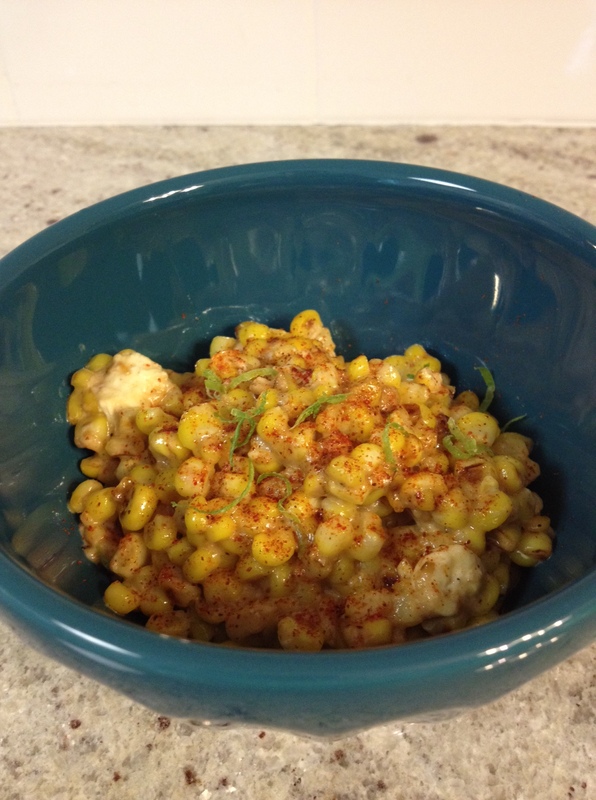 This corn dish is so incredibly delicious, that my husband and I literally fought over it. I made the mistake of serving it in a shared bowl on the table, as opposed to portioning it out onto our plates… and we kept attempting to steal the bowl from one another. It almost came to blows. Honestly, I am still sort of surprised by how I stumbled across the idea for this dish. This past weekend, Crist and I were out to dinner with my husband, at a new restaurant in the city I live in. When I picked out my meal (a fried oyster po’ boy), I decided that I didn’t really want the fries that were supposed to accompany it (yeah, I’m not sure if I was feeling ill, or what – I never, EVER turn down french fries). I saw the description for this corn side on the menu, and, in a move incredibly uncharacteristic of myself, decided to sub it for the fries… and I will now be recreating it once a week for the rest of my life. For real. 1.) Heat a large skillet over medium-high heat, and melt the butter in the skillet. 2.) Season the corn with the salt and pepper, and then add it to the skillet. Stir constantly for a minute or so, until the kernels develop deep brown edges; once the edges of the corn are nicely browned, cut the heat back to medium. 3.) Add the cayenne, and stir to combine. Add the heavy cream, and stir until the cream has been absorbed/created a sauce of sorts on the corn, about 30 seconds. 4.) Stir in the lime juice and the feta, and serve immediately. Sprinkle a bit more cayenne on top for garnish, if desired. All I can say is that I would eat this corn as my dinner, straight from the bowl, with a giant spoon. It is the most amazing combination of sweet, salty, spicy, and sour, and it would make an excellent addition to almost any main course – chicken, fish, beef, or anything else you can come up with. I’d advise that you make it immediately, and as often as possible. Do it!! Let me know how it goes. Could you use frozen corn for the recipe??? Absolutely! I would thaw it completely, and then pat it dry a bit (with some paper towel or a clean kitchen towel) to remove some of the moisture – that way you’ll still get some nice browning on the edges of the corn. Good luck! the only way i’d have been more surprised by your side choice was if you’d ordered the roasted beets. Pingback: Weekend Recap: Camping Trip! This is absolutely DELICIOUS!!!!!!!!! I can not tell you how much I loved this dish! I could have eaten every last bit of it and had my husband not been home I would have! Sounds amazing and want to try! Do you cook the corn on the cob first before adding to the butter? Hi Julie! Nope, no need to cook the corn before cutting it off the cobs – the few minutes in the skillet are all it needs! Enjoy!